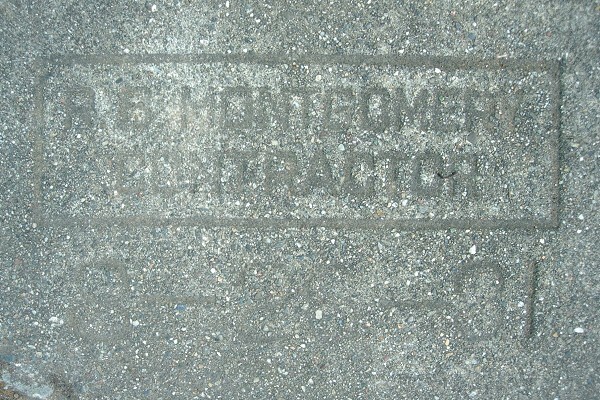 The Andersen & Montgomery partnership did a small number of surviving sidewalks in the Piedmont Avenue neighborhood and in Piedmont. 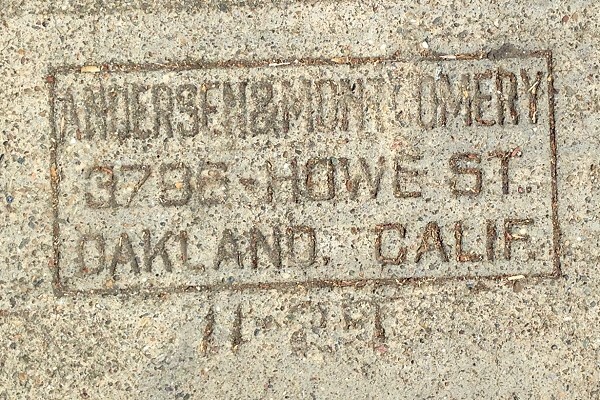 This mark, from 1927, is at 945 Wildwood in Piedmont. I’ve found two other marks dated 1929, but usually there are no dates. The address on the stamp, 3796 Howe Street, was wiped out by the construction of the MacArthur-Broadway shopping center and then by the new Kaiser hospital building. 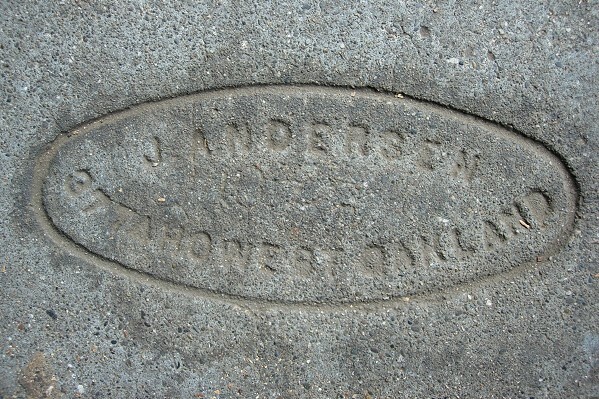 John Andersen lived there with his wife Hulda (Lobel), according to the 1930 directory and the census. He was born in Denmark in 1859 and immigrated to the U.S. in 1883. Hulda was German, born in 1864, and immigrated in 1888. So they were pretty old by this time. She died in 1954, but I don’t know about him. These date from 1912 to 1928 and are found mainly in North Oakland. Robert B. Montgomery was a much younger man, born in Colorado in 1904 or 1905. He married the former Alice Sueell in 1929 and raised a family at 2626 Ivy Drive, where her folks lived. He dealt with bungalows, mainly. He is also responsible for this 1931 stamp on E. 24th Street. It’s the only dated example I’ve found. Montgomery got in the paper in 1951 when he bought the Olympic Hotel building, at 2nd Avenue and E. 12th Street, and moved it across the street. This entry was posted on 28 July 2017 at 8:01 am and is filed under Profiles, 1927. You can follow any responses to this entry through the RSS 2.0 feed. You can skip to the end and leave a response. Pinging is currently not allowed.